Welcome to an early edition of Classroom Law Project’s weekly current event resource for teachers! We prepared the CLP Current Event, Constitution Day with Emphasis on the Preamble, early so teachers have extra time. Find resources for a great day in the classroom on Constitution Day, September 17! Each year, on September 17, Americans celebrate Constitution Day and Citizenship Day. In addition, September 17-23 is also recognized as Constitution Week. Constitution Day (or Citizenship Day) is an American federal observance that recognizes the adoption of the United States Constitution and those who have become U.S. citizens. It is generally observed on September 17, the day in 1787 that delegates to the Constitutional Convention signed the document in Philadelphia. What is the Preamble to the U.S. Constitution? What does the Preamble say to us in 2017? What grade would you give the United States for accomplishing the goals set out in the Preamble? For example: Evaluate what steps we might choose to take to “insure domestic Tranquility”. How important are the first three words “We the People”? Should the Preamble be used in interpreting the meaning of the Constitution? 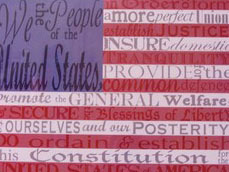 Is there a missing piece in the Preamble that we might add today? Is the Preamble an introduction, a road map, or a set of values (mission statement)? Or all three? Why did the Framers include a Preamble? Was the Preamble a response to the failed Articles of Confederation? Was the Preamble a promise to unite the country? Why or why not? How do the Preambles to other constitutions compare to the US Constitution? To the state constitution? What is the main similarity or difference? Is there an order in the aspirations stated in the Preamble? Why was “in order to form a more perfect Union” the first goal? Why was “establish Justice” the first specific goal? Which of the sections of the Preamble is most important to you? What is the connection between Citizenship Day and Constitution Day? While you may think that that the phrase “We the People” is talking about all Americans, there is actually much more to the phrase. “We the People” includes all the citizens of the United States of America. (Importantly, )this phrase shows that it was just the framers of the Constitution of the legislators who were giving powers to the government. Instead, the government gets all of its powers from all of the Citizens of the United States of America. CLP says: check it out! CLP says: do not let the past-due date forum detract from other features; find chronology and rich connection to Preamble. CLP says: we recognize that this is opinion; we also recognize that the questions posed are good ones. … the words are not always easy to follow … examine each sentence in the Preamble and explain it for today’s audience. CLP suggests ignoring the ads because the phrase-by-phrase explanations are worth it. CLP loves National Constitution Center materials! CLP urges using this teacher- and kid-friendly site! In addition Find discussion of answers to questions such as, What is the meaning of “in order to from a more perfect union?”, What does the Preamble say?, and What does the phrase “do ordain and establish this constitution” mean? CLP challenge: find your favorite! “We the people of the State of Oregon to the end that Justice be established, order maintained, and liberty perpetuated, do ordain this Constitution.” Effective February 14, 1859. A draft version of the Oregon State Constitution’s preamble and bill of rights; written in 1857. 8.6 Use and interpret documents and other primary and secondary sources pertaining to U.S. History from multiple perspectives. 8.18 Examine and analyze important United States documents, including (but not limited to) the Constitution, Bill of rights, 13th-15th Amendments. 8.21 Analyze important political and ethical values such as freedom, democracy, equality, and justice embodied in documents such as the Declaration of Independence, the U.S. Constitution and Bill of Rights. HS.32 Examine and evaluate documents and decisions related to the Constitution and Supreme Court decisions (e.g., Federalist Papers, Constitution, Marbury v. Madison, Bill of Rights, Constitutional amendments, Declaration of Independence). Unit 4, Lesson 18: How did the people approve the new constitution? Unit 2, Lesson 13: What was the Anti-Federalist position in the debate about ratification? Unit 4, Lesson 26: How does American federalism work? *We the People: The Citizen and the Constitution, Level 3, 4th Ed., 2016, and Level 2, 2017, Center for Civic Education.